NEW YORK (CNNfn) - The decade began with Mickey Mouse replacing the nation's steel giant. It ends with two icons of the information economy replacing two symbols of America's gritty industrial era. 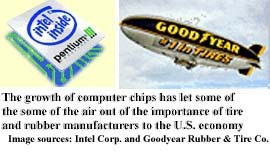 When Charles Dow created the Dow Jones industrial average at the end of the 19th century, he could never have conceived of some of the components that would take it into the 21st century -- Walt Disney Co. (DIS), Microsoft Corp. (MSFT) and Intel Corp. (INTC), let alone the products they produce. What is an industrial company? People may not think of an entertainment conglomerate like Disney or a financial services company such as Citigroup Inc. (C) when they hear the word "industry." But those companies, along with the other 28 members of the Dow, do a pretty good job at capturing the broad scale of the nation's economic landscape, according to experts. "One objective of the Dow is to have a great deal of breadth," said Michael Lehmann, professor of economics at the University of San Francisco and an expert on the Dow and U.S. economic history. "It's amazing for 30 stocks that it does such a good job." When the average began in 1896, its 12 components were all heavy industrial concerns -- such as U.S. Rubber or Tennessee Coal & Iron. The latest changes -- which include dropping oil company Chevron Inc. (CHV) and Goodyear Tire & Rubber Co. (GT) -- leave the index with only one oil company, Exxon Corp. (XON), and no tire or rubber company. The homogenous nature changed long ago, both within the index and within many of its component companies. Sears was the first retailer added, in 1924, and when the index expanded to 30 stocks in 1928, one of the new members was a movie company, Paramont Publix. One reason for the change in Dow components announced Tuesday was to try to reduce redundancy in the index, said John Prestbo, editor of Dow Jones Indexes and markets editor of the Wall Street Journal. Even though Goodyear is the last rubber company, that sector is reflected by the continued presence of General Motors Corp. (GM), he said. It was a more difficult call, he said, when Bethlehem Steel Corp. (BS) was dropped in 1997, following the 1991 departure of USX Corp. (X). "We felt other parts of the market and the economy was much more important and deserving of direct representation," he said. The easiest company to exclude was Union Carbide Corp. (UK), a member of the index for 71 years that is being purchased by Dow Chemical Co. (DOW). Dow Jones decided to add SBC Communications Inc. (SBC) to give it a presence in local phone industry, along with greater exposure to wireless and Internet communications, Prestbo said. The only original component now on the index is General Electric Corp. (GE), but that stock has been in and out of the index a couple of times in the last century. And the company itself has changed, becoming a major provider of financial services and the owner of the NBC television network. "If it had stayed the same company, it would have been dumped a long time ago," Prestbo said. On a symbolic level, perhaps the most important change announced Tuesday is the addition of Nasdaq stocks to the index for the first time, a sign of the tremendous broadening of the nation's base of investors. "I think the growing interest in stocks has made the growth of the Nasdaq possible," said professor James Butkiewicz, chair of the economics department at the University of Delaware. "I don't think the location means as much anymore." Officials from Nasdaq had made pitches over the years to the editors at Dow Jones to include a stock from their exchange on the Dow Jones industrial average, Prestbo said, and numerous readers had pushed to include Microsoft and/or Intel. The National Association of Securities Dealers Inc., parent of the Nasdaq exchange, issued a statement Tuesday praising the decision to add Intel and Microsoft. But breaking down that barrier was a relatively easy decision for the committee that picks the Dow components, Prestbo said, agreeing with experts who don't think the exchange on which a stock is traded is of great importance to investors. "It used to be if you wanted securities, you bought through an established broker on the Big Board," Butkiewicz said. "Now you hear about it on the Internet and buy through a discount broker. And in the previous periods, Nasdaq stocks would aspire to be New York Stock Exchange stocks. Now they don't necessarily." There are still many major manufacturers on the index, including GE, General Motors Corp. (GM) and Boeing Co. (BA). "It isn't as if there's no manufacturing left in the U.S. economy or the Dow Jones industrial average," Lehmann said. "As much as the Information Age has changed the U.S. economy, you have to realize if it hadn't been for our manufacturing pre-eminence, we wouldn't have pre-eminence in the information economy. It derives directly from the U.S. lead in computers, which goes back to our manufacturing base. I don't think manufacturing is finished by any means." Even the change of one retailer for another -- such as Home Depot Inc. (HD) taking the place of Sears Roebuck & Co. (S) as of Monday or Wal-Mart Stores Inc. (WMT) taking the place of the company then known as Woolworth Corp. in 1997 -- shows that the nation's economy is always evolving, always changing. "That's the history of business in this country," said Yale Hirsch, editor of the Stock Trader's Almanac. "Wal-Mart did something differently, and Home Depot certainly did something different, and Sears stayed the same. If you don't respond to changes, you can be left behind and find yourself in trouble." Sears issues a statement expressing disappointment in the decision. 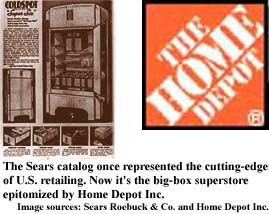 Peggy Palter, a spokeswoman for the Hoffman Estates, Ill., retail giant, said the company didn't see the decision as an indication that Home Depot had won a battle with Sears to be the nation's premier supplier of hardware. "If you look at the statements from Dow Jones, they were looking to add a specialty retailer," she said. However, the company's statement bristled at its exclusion from the index. "Any suggestion that today's changes, 'will make the Dow Jones Industrial Average even more representative of the evolving U.S. economy,' is misguided," the statement said. "With more than $40 billion in revenues, 300,000 employees and relationships with 65 million households, Sears certainly plays a relevant role in the U.S. economy."